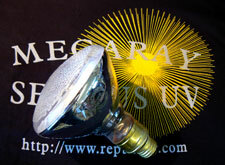 Description: Randall's Reptiles is pleased to announce that we are now carrying the Mega-Ray Mercury Vapor UV Bulbs. Bulbs are available in 100 watt, 160 watt and 160 watt Zoo. All are self ballasted bulbs and come with an extensive warranty. I'm glad you sell this because i was going to buy the Zoo kit in the states. Does it come with the external Ballast as well for heat control? And how much are you selling the kits for?